After a fabulous breakfast of scrambled eggs, bacon, and pancakes with John and Linda we left for the trip through Dallas & Fort Worth. Planning to stay just past Fort Worth, I decided to continue another 84 miles (350 total for the day) on US 180 to a dot on the map called Albany, TX. The population was 1,921 in 2000. It was the only town on the route showing an RV Park. This is an adventure for us as you never know what you are going to find. The Albany Motel & RV Park turned out well with full service sites. 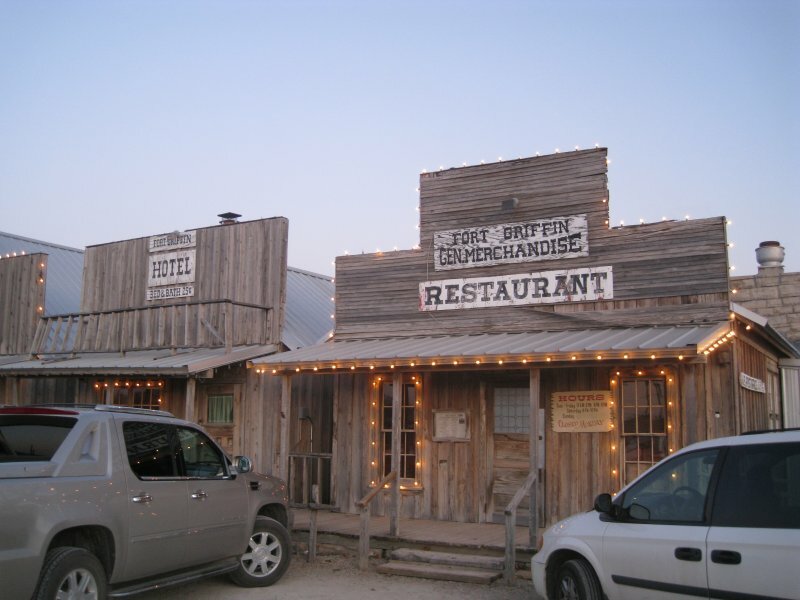 I asked at the front desk about restaurants and was told to head for the Fort Griffin General Merchandise Beehive Restaurant. It had been written up in a magazine I was told. Wow, what a great place. Mavis had an enormous hamburger and I had a great NY steak. The dining room only held about 30 people and we had to wait 30 minutes to get in. It was well worth the wait, and when you have the motor home to wait in, it is not a problem. Another first today was the temperature which rose to 65. With the extra miles we put in today, we'll be in New Mexico tomorrow.